Typically this is a strange week, between Christmas and New Year’s, when most of us face the rigors of winter, the chronic stop-and-go commotion that passes for merrymaking, and the nagging remorse for all the things we earnestly committed ourselves to do this year — which, by now, we’ve sheepishly decided to carry over into 2013 like a cheap bookkeeping trick. 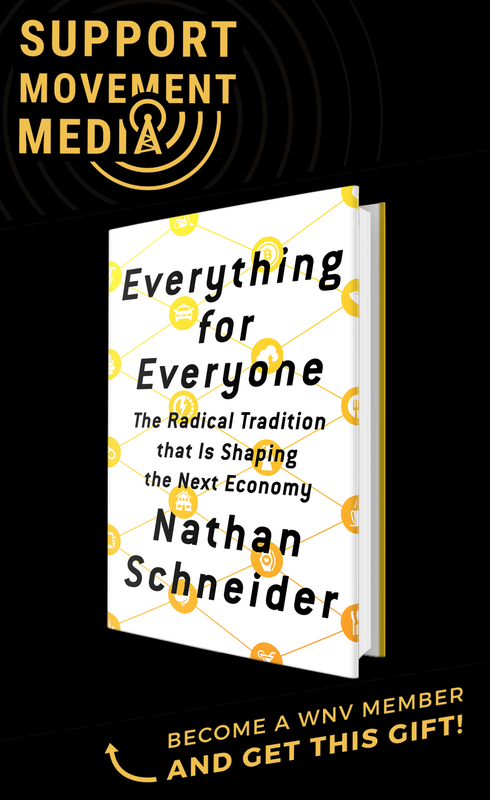 These annual existential tremors got an extra jolt last Friday as we faced the prospect of the world coming to an end — first physically, then financially. Given the peculiarity of this week, I found myself in a holiday mood surfing Netflix and landed on a strange helping of Bob Hope. For those who don’t know him, Hope was a mid-century comedian featured in a string of low-budget road pictures, in which he often co-starred with Dorothy Lamour and Bing Crosby. Bob Hope and Christmas? It was probably his long-time collaboration with Crosby, who sang “White Christmas,” that induced this neural cross firing. In any case I clicked on what turned out to be the first episode of a short-lived television show called “Bob Hope: The Comedy Hour” and found myself peering into a temporal periscope that zoomed me back in time to the United States of 60 years ago. Delivered on the blotchy-gray canvas of the precursor of videotape, the program is a cultural snapshot that would allow us to evaluate social progress if, like our children, we subjected our society to a periodic standardized test. And my would-be assessment: America’s cozy relationship with the military has both changed and stayed the same. In this first episode, it is May 1952 and the show is being broadcast live from a makeshift outdoor theater at the Presidio Army Base in San Francisco. The camera pans across the San Francisco Bay, the then-active prison on Alcatraz Island and the gleaming city, until it finally focuses on the stage and the thousands of members of the Armed Forces in the audience. Hope is doing stand-up, spouting one-liners and his own brand of self-deprecating humor. This is years before Johnny Carson — and even more before David Letterman — but the template for the late-night monologue is already there: banter with the bandleader, cracks about the weather (the sun keeps disappearing into the fog) and a string of jokes about the political scene. The presidential election is on, and there is a cascade of gags about the Democrats (Adlai Stevenson would be the party’s nominee but Hope’s airspace is devoted to Estes Kefauver, the Senator from Tennessee who had made a name for himself by leading a Congressional investigation into organized crime) and Republican Dwight Eisenhower, who would eventually win the fall contest. The show consists of guests, skits and musical numbers. The humor is fairly genial and safe. The pioneering comedy of Lenny Bruce, George Carlin, Mort Sahl and Richard Pryor — let alone today’s work by Sarah Silverman, Louie C.K. or Margaret Cho — are years off. Their efforts to assert freedom of speech or to tackle the political and cultural realities of racism, sexism and homophobia will, beginning in the 1960s, seriously challenge both the assumptions about comedy and the society which comedy encodes and reinforces. Just as future comedians will challenge the world that Hope so confidently projects, so will social movements a decade later begin to challenge a world that assumes the cozy relationship with the military on display here. Hope, who emigrated from Britain in 1908 at five years old, cultivated a strong sense of U.S. patriotism throughout his life. This was not his first show on an army base. Beginning in 1941, he entertained troops throughout World War II, the Korean War, the Vietnam War and right on up to the Persian Gulf War in 1991. His 57 tours were sponsored by the Defense Department, his corporate sponsors, and NBC, which often broadcast them as television specials. This coziness with the military comes through in the references that Hope makes during his monologue to an atomic bomb test that had occurred a few days before at the Nevada Test Site. The aboveground test was filmed and broadcast nationally. In the early 1950s the national security state sought to normalize nuclear weapons. To do this it had to transform something that signified unmanageable terror into a something of manageable fear. It had to establish support for this new weapon system by conveying its awesome power but also its domestication. It was dangerous, but controllable. Hope’s bit strikes these chords. Atomic power is clearly hazardous and unpredictable, but its volatility and side effects can be brought down to earth. Most of all, they can provoke laughter — which, like almost all laughter, relieves tension and anxiety. Nothing could provoke tension and anxiety more in 1950s America than the prospect of thermonuclear war. Bob Hope, among others, helped alleviate this fear without removing its cause, something that all-powerful regimes rely on to manage the populace. Eventually, a series of social movements would challenge this domestication of nuclear arms and the public acquiescence on which it rested. 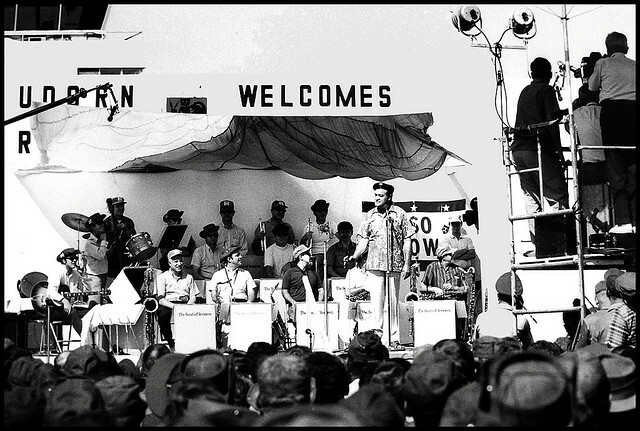 (These movements had some of their roots in San Francisco of 1952, including the then-emerging Beat generation and Allen Ginsberg’s percolating poem, “Howl.”) With the emergence of people-power movements from the 1960s forward, a national broadcast of a nuclear detonation or a comedy show from an Army base would at least provoke critical questions and likely would not be countenanced in the free and easy way that Hope’s 1952 program would. Nor would several other aspects of that particular broadcast, including what are now considered — with our post-liberation movement lenses six decades later — to be offensive skits about Chinese-Americans, Italian-Americans and traditional gender roles. The notion of the United Service Organization roadshow entertaining troops provoked strong criticism during the Vietnam War, which Francis Ford Coppola captured in his vivid depiction of a show going very wrong in Indochina in his film Apocalypse Now. And, perhaps most tellingly, the Presidio Army Base — which served as the backdrop of Hope’s first episode of the comedy hour — was converted to a national park in the 1990s. However, the shifts since 1952, while real, have not dislodged the fundamental militarism at the heart of this society. In our own time, the Pentagon seems to have decided that public support is such a given that it can afford to pursue a McLuhanesque “cool” approach to its interface with the population. Yet, “cool” or not, the Pentagon’s power is immense and will not hesitate to call on the next Bob Hope to buttress it. In 1997, I spent several days camping out at the Vietnam Wall. I was considering writing my dissertation about the wall as a site of U.S. pilgrimage, and I wanted to get a sense of how people respond to it. (In the end, I wrote about something else.) Like many others, I was struck by the instantaneous reverence these thousands of pilgrims each day assumed as they approached the wall with over 58,000 names of the U.S. war dead. On the third afternoon, there was an unusual uproar, and then the whir and clicking of press cameras. A golf cart pulled up — Bob Hope was sitting there. He had just been to the White House, where President Bill Clinton bestowed a national honor on him. Now he was here, to see the wall. He clambered out of the cart and shambled over to the monument. He simply stared at it. He was 94 years old, and he seemed to be in another world. The reporters tried to get him to touch the wall. In the end he did, but only when they told him that, on this chilly day, it was warm. As he walked back to the cart he straightened up and tried to say something, but it didn’t come. I was thinking about this moment when I watched the 1952 video. I cannot presume to know what he was thinking about this wall dedicated to a war he promoted. Perhaps it simply confirmed something about his life. Perhaps it was a question, tugging at him. Or perhaps he was formulating a question that is there for all of us. For his more anti-war fans, maybe that seems like a cop-out. But really, I think Louie, as is typical of his character, is selling himself short. The episode is actually quite subversive in its own way, without being insulting or antagonistic. In that sense, it invites a wider audience to consider the ramifications of war. Bob Hope himself would have had to laugh. The show mentioned was in my youth. Bob Hope had done the USO tours during WW2 and afterward. During the VietNam war protests, one slogan was “Stop the war, keep Bob Hope home for Christmas”. I strongly suspect he logged more miles to more bases than most of the Joint Chiefs ever did. It would be worth also mentioning Stephen Colbert’s adoption of Bob Hope’s mantle as TV’s Entertainer of the Troops. I’d love to see an analysis of how Colbert compares to Hope by someone who can stand to sit through Colbert’s military episodes.